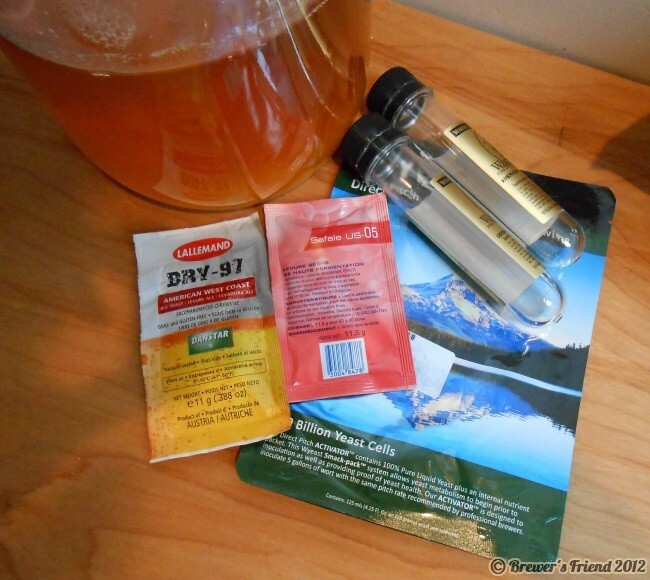 To make high quality beer consistently, understanding your yeast pitching rate is important. In fact, this may be the key to taking your beer to the next level. It turns out that liquid yeast manufacturers give you barely enough to get by, which we explain in detail below. The yeast pitching rate describes how much yeast is going into the fermentor, per gravity unit. The standard rate is expressed as million cells / milliliter of wort / degree plato. Higher gravity beers and lagers call for a higher pitch rate. If the pitch rate is too low the yeast get stressed and produce undesirable byproducts, including soapy, chemical, and corn flavors (yuck!). Stressed yeast can even stall out, resulting in an incomplete fermentation (half way between beer and wort – not good). Our yeast pitching calculator makes choosing and hitting your desired pitch rate very simple. What is the impact of the yeast pitch rate on the beer? A higher pitch rate leads to cleaner flavor profile because the yeast are reproducing less. A lower pitch rate can bring out more flavor from the yeast, but can also lead to inconsistency batch to batch. What is the standard pitch rate? A popular study done by George Fix concluded a rate of 0.75 million cells / ml / degree Plato is appropriate for ales, and double that for lagers. Other popular brewing tools use this number, though some opt for 1.0 instead of 0.75. Lagers require about twice the pitch rate of ales, since they ferment at lower temperatures. Pro brewers pitch at a higher rate to mitigate risk of infection, ferment quickly, and ensure a consistent product. Serious home brewers who want to get excellent beer pitch at higher rates too. Our analysis indicates that at present, the liquid yeast manufacturers like White Labs and Wyeast give home brewers just barely enough yeast cells to get by for a typical batch of Ale. They say one pack or vial is enough for 5 gallons of wort at 1.060 and contains approximately 100 billion cells. This comes out to a pitch rate of 0.35 million cells per milliliter per degree plato. This is half the rate of what pro brewer’s use. Why the low pitch rate from the manufacturers? In their defense, the product does contain extremely healthy first generation yeast. One justification might be that the 0.75 rate really applies to pro brewers – who repitch. That re-pitched yeast contains some trub, dead yeast, and other junk, so the 0.75 rate is not as pure as the 0.35 manufacturer’s rate. Repithched yeast can’t be 50% gunk, probably closer to just 10% after washing. What pitch rate makes sense for the home brewer? We asked a gold medal winning brewer and home brew store owner about this. He says he would never pitch at a rate of 0.35, and makes a starter for anything above 1.040 for a 5 gallon batch. We are convinced as well, though we realize making starters is not always an option for everybody. In our yeast pitch and starter calculator, we left it open so you can choose, or at least see what the manufacturers recommend vs the pros. A) Spend more money on fresh yeast (liquid or dry). B) Make an appropriately sized starter – our yeast calculator handles that. With dry yeast it is cost effective to buy more packs rather than make starters. C) Re-pitch slurry from a previous batch. This should only be done under ideal circumstances (healthy fermentation, within 7-10 days, correct temperature range, beer below 6.5% ABV etc). If a brewer tells you they pitched X number of yeast cells, that is just part of the story. What you really want to know is the pitch rate in million cells / milliliter of wort / degree Plato. Total yeast cells pitched only matters after you know the volume of the wort AND its gravity. Reason being – it takes more yeast to work through a higher gravity beer. You might also ask what generation the yeast were, what the slurry density was, and at what temperature the yeast were cultivated at.